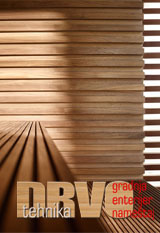 DRVOTEHNIKA.INFO is a wood industry portal which provides its visitors with plenty of useful information in the field of wood industry as well as with a unified, momentary access to the information from different sources, split up into categories and areas. Our aim is to promote the communication and cooperation of entrepreneurs and experts in woodworking business on one hand and companies who deal with woodworking businesses on the other. The portal intends to be of use to all the people working with wood, in any way. Our idea is to keep the DRVOTEHNIKA.INFO portal informative, up-to-date and punctual.